The Burmese python became increasingly ‘vulnerable’ in the last century due to hunting for the leather market, native food and medicines, and the pet trade but captive breeding has enhanced its status in the wild. Good climbers when young and excellent swimmers, Burmese pythons can attain around seven metres (23ft.) in length and weigh up to 90kg (200lb). They kill prey by constriction. 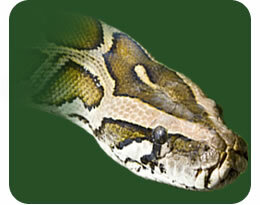 Burmese pythons can remain submerged in water for up to 30 minutes without taking air.